Cover of What Our Lettering Needs by Rick Cusick (2011). Design by Rick Cusick. 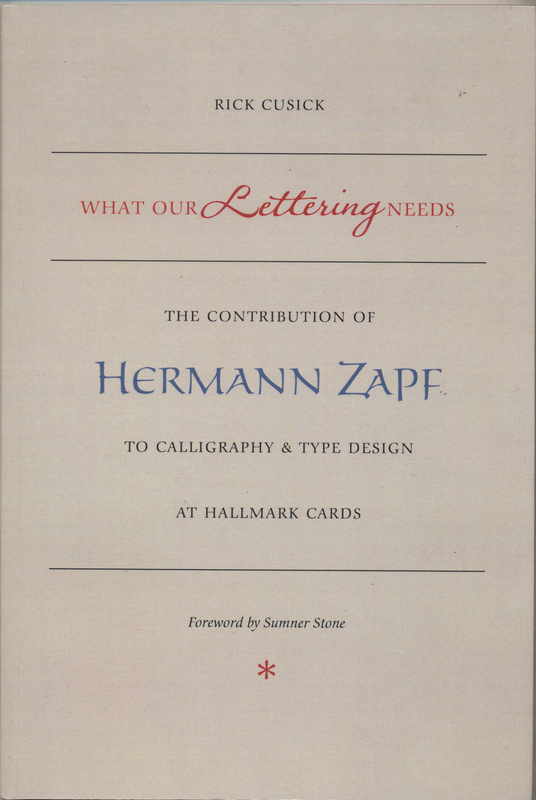 What Our Lettering Needs: The Contribution of Hermann Zapf to Calligraphy & Type Design at Hallmark Cards by Rick Cusick, a Hallmark “lifer”, is also published by the RIT Cary Graphic Arts Press, but it is a far different book than About More Alphabets. It too is a small book, but one that deals with a limited aspect of Hermann Zapf’s career that has often been unfairly overlooked: the period from the mid-1960s to the early 1970s when he was associated with Hallmark Cards in Kansas City. As such, What Our Lettering Needs represents an appropriate marriage of ambition and production. The ofﬁcial length of Zapf’s relationship with the greeting card giant was seven years, from 1966 to 1973, but it began with a visit in 1965. The idea for the unlikely pairing of a German type designer and a heartland American company came from Hans Achenhold (1905–1988), then the head of Hallmark’s graphic arts division. Achenhold was born in Germany and had worked there as a lithographer before escaping Dachau to come to the United States. He joined Hallmark in 1940. His suggestion to hire Zapf followed the distribution of a memo entitled “What Our Lettering Needs” a year earlier by company president and founder J.C. Hall. In the memo, the source of Cusick’s title, Hall told his staff that the company needed to improve its lettering as a means of improving its greeting cards. The memo set off a search for a consultant who could instill quality in Hallmark’s lettering. According to Cusick, Mortimer Leach, author of Lettering for Advertising (1956) and Letter Design in the Graphic Arts (1960) and a longtime teacher at Art Center in Pasadena, was approached but turned down the offer. Achenhold suggested Zapf. His idea was supported by Harald Peter, another German emigré at Hallmark who had studied under Georg Trump (1896–1985) and Herbert Post (1903–1978). Although Hall had conservative taste in lettering—he believed that lettering “should be simple and clear in the most attractive style” so that it would not upstage the illustration on the greeting cards—he also had a passion to hire the very best according to Cusick. Zapf was only one of several top-flight consultants that Hall had hired over the years, among them Walt Disney (1901–1966), architect Edward Durell Stone (1902–1978), industrial designer Raymond Loewy (1893–1986), and designer Alexander Girard (1907–1993). Zapf shared Hall’s instinct for quality. In Cusick’s view The Art of Hermann Zapf had three effects: 1. it helped to improve lettering at Hallmark Cards as Zapf introduced pen twisting and pressure techniques, 2. it helped to recruit new and better lettering artists to the company (among them Sumner Stone, Jim Parkinson, Pat Kahn and Cusick himself), and 3. it was good public relations for the company. 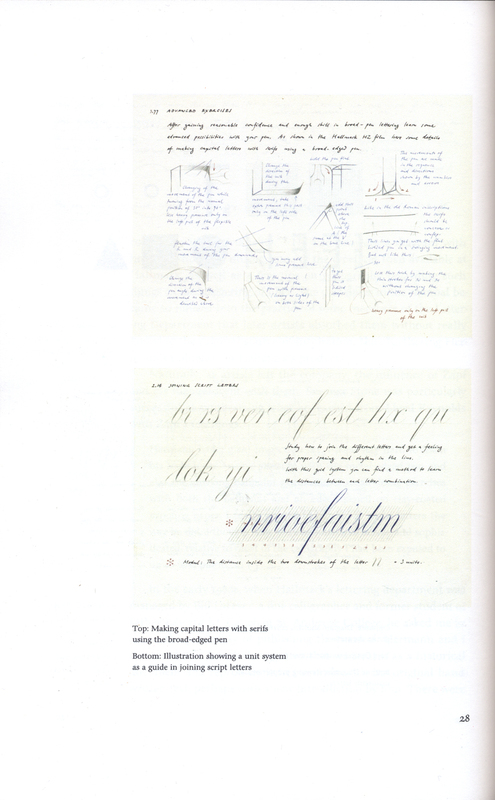 As the ﬁrst public exposition of Zapf’s calligraphic philosophy it was one of the key forces in creating the calligraphic revival of the 1970s. The second impact of Zapf’s association with Hallmark was the creation of the Hallmark Lettering Instruction Book (known within the lettering group simply as “the Manual”), originally written in 1968 to accompany seminars that he gave at the company. 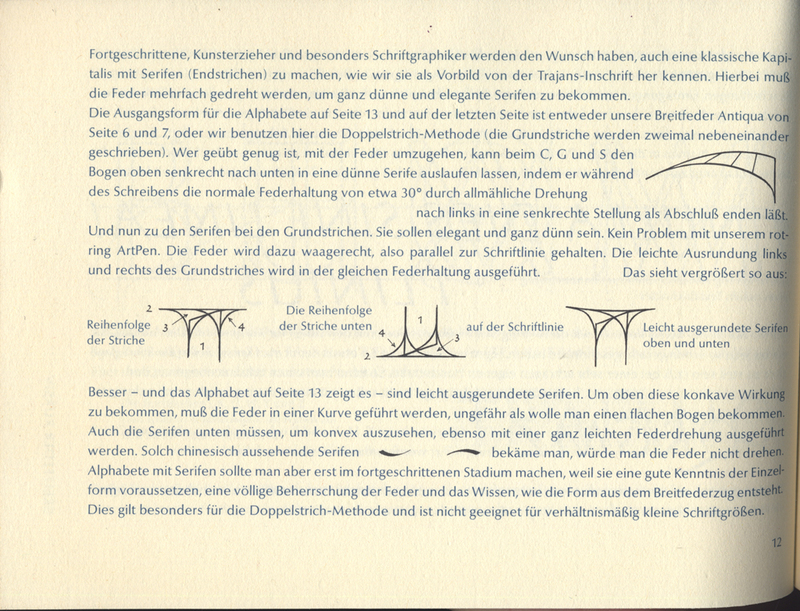 [The image on p. 24 has 1970 as date; Hermann Zapf and His Design Philosophy, p. 114 says 1966–1969.] The manual focused on “new training methods, unusual tricks, and time-saving techniques” that Zapf had developed in his own work. It went beyond traditional broad pen calligraphy to include a section on “The Flat Principles of the Broad Pen” as well as instruction in how to draw pointed pen scripts for photocomposition using repeated structural elements, and the creation of pre-made flourishes for use with calligraphy or type. Although the Hallmark Lettering Instruction Book has never been published, much of the broad pen information in it eventually found its way into Creative Calligraphy / Kreatives Schreiben, a 1985 manual by Zapf published in four languages by German technical pen-maker Rotring. Pages from the Hallmark Lettering Instruction Book (1968) by Hermann Zapf. From What Our Lettering Needs, p. 28. Instructions on making serifs from Kreatives Schreiben (1985) by Hermann Zapf. At the same time that Zapf was beginning his consultancy with Hallmark, the company was establishing an in-house photocomposition service and creating an Alphabet Group, led by Myron McVay, to design original alphabets for it. McVay was a student of Doyald Young who had joined Hallmark in 1961. Since 1964 he had been drawing alphabets for the company’s Filmotype system. The Filmotype machine was supplanted initially by a VGC Phototypositor and then by an Alphatype system, the latter acquired in part upon the recommendation of Zapf. For Hallmark (and the Alphatype) Zapf designed nine original typefaces and three “phantom” faces (to use Cusick’s phrasing) and helped commission two others, one by his wife Gudrun Zapf-von Hesse and the other by Joachim Romann. These faces are among the least known of Zapf’s oeuvre since they were and still are exclusive to Hallmark. The ﬁrst typeface that Zapf designed for Hallmark was Jeannette (1966/1967), a script based on the handwriting of Jeannette Lee, who joined Hallmark as an assistant to the creative director in 1939 and eventually became vice president of corporate design. It’s many alternates and ligatures—there are 133 characters in the showing in What Our Lettering Needs—mark it as a forerunner to Zapﬁno. For this reason, as well as the uncanny way in which Zapf managed to meld his own cursive aesthetic with that of Ms. Lee’s, Jeannette may be the most impressive of Zapf’s Hallmark typefaces. Jeannette Lee’s handwriting and the Jeannette typeface (1967) by Hermann Zapf. From What Our Lettering Needs, p. 41. 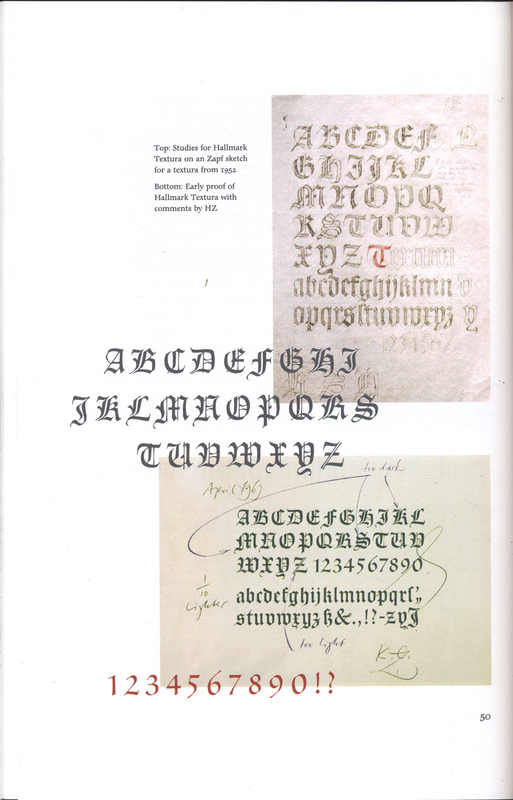 Hallmark Textura was Zapf’s refined interpretation of Morris Fuller Benton’s Cloister Black, a more legible and softer “Old English”. It was designed at the same time as Hallmark Uncial. The two were intended to be mixed together under the name Stratford, one of the “phantom” fonts that Cusick cites. These are typefaces made by combining the capitals of one face with the lowercase of another, a trick that Frederic Goudy employed. For Hallmark, Zapf created Stratford and Charlemagne (not to be confused with Carol Twombly’s design) and Winchester (not to be confused with W.A. Dwiggins’ face of the same name) by pairing Shakespeare (1967), designed by his wife Gudrun Zapf-von Hesse for Hallmark, with Hallmark Textura and Hallmark Uncial respectively. Sketches and proofs for Hallmark Textura (1969) by Hermann Zapf. From What Our Lettering Needs, p. 50. Missouri looks like two other typefaces that Zapf was working on at the same time in the early 1970s: Noris Script (designed 1971–1975; issued by Mergenthaler Linotype 1976) and Zapf Civilité (designed 1971–1974; completed 1983). Paul Hayden Duensing commissioned Zapf Civilité for use in his private press. It was the last metal typeface designed by Zapf. Zapf was clearly working on several themes in the late 1960s/early 1970s. Another example is Crown Roman and Italic, the typefaces that Cusick has used to set What Our Lettering Needs. It is closely related to Comenius (1972–1973; released 1976), which he did a few years later for Berthold GmbH. (Jerry Kelly chose Comenius as the text face for About More Alphabets.) Cusick sees the origins of Crown Roman—the only Hallmark typeface by Zapf that is not overtly calligraphic—in early designs for Hunt Roman (1961–1963), a proprietary metal typeface that Zapf created for the Rachel McMasters Hunt Botanical Library in Pittsburgh. However, the ﬁnal version of Hunt Roman, marked by a tall x-height, is very different from Crown Roman. But both are part of the evolution of Zapf’s thinking about what a contemporary oldstyle typeface should look like, an evolution that began in 1950 with his much-celebrated Palatino. An unusual aspect of Crown Italic, which goes unremarked by Cusick, is that it has upright swash caps—something not found in Zapf’s other chancery-inflected typefaces. Calling them “handsome”, he points out that the caps can be used with the roman lowercase as well as with the italic lowercase. Scriptura, Zapf’s last typeface for Hallmark is probably the least known of them all. Cusick sees a superﬁcial connection to Giovan Francesco Cresci’s cancellarescha testeggiata, but I see a closer resemblance to the delicate, narrow script of French writing master Lucas Materot (b.1560)—though, ultimately, the typeface is pure Zapf. * It is a light italic with plain and swash capitals and two sets of lowercase letters, one normal and one consisting of alternates, most of them swashed. The plain capitals are sans serif. There is nothing else like it among Zapf’s type designs—except maybe Zapﬁno. At Hallmark, Scriptura was seen as an alternative to the more traditional Firenze. Scriptura capitals (1972) by Hermann Zapf. From What Our Lettering Needs, p. 57. Scriptura swash capitals and lowercase (1972) by Hermann Zapf. From What Our Lettering Needs, p. 59. The two typefaces that Zapf midwifed for Hallmark are Shakespeare (1967), a roman and italic, by his wife Gudrun Zapf-von Hesse and Constanze (1968) by Joachim Romann. Cusick traces the roots of Shakespeare’s roman, a semi-sans (in the parlance of Rotis), to a 1962 calligraphic rendition of a quotation from The Little Prince by Zapf-von Hesse. (For some reason Shakespeare has been available for general sale from Linotype, a fact not noted by Cusick.) Naturally, both the roman and the italic share traits with Zapf-von Hesse’s typefaces Diotima and Alcuin. Romann’s Constanze, a pointed pen script, is a variation on two typefaces of the same name he had previously designed in metal for Klingspor (Constanze, 1955; and Constanze Initials, 1955). The new design has several alternate letters (both capitals and lowercase) as well as numerous double letter combinations and ligatures. Because of the freedom afforded by photocomposition the typeface has a greater slope than its predecessors and several letters (e.g. f and j) have more fluidity and grace. Cusick says that McVay designed a condensed version of Constanze in 1971 for use in narrow greeting cards. One wonders why Zapf himself never did a pointed pen-inspired typeface for Hallmark given the inclusion of such letters in the Hallmark Lettering Instruction Book—and his own excellent Virtuosa. Cusick also says that Zapf proposed a series of typographic ornaments which were considered and then dropped. Similarly, other alphabet designs were suggested, including swash characters for Crown Roman, but never accepted. Cusick was unable to ﬁnd out what happened to these ideas, though he does reproduce sketches for them (p. 87). Summaries of the typefaces that Zapf designed for Hallmark form the bulk of Cusick’s text. “As a whole,” he writes, “this collection of calligraphically inspired alphabets added a new dimension to the appearance of Hallmark products while providing Hallmark lettering artists with an abundant supply of models to study.” (p. 65). Along with character sets and samples of each face he shows doodles, sketches and proofs by Zapf, many of which have never been reproduced before. This is one of the chief values of What Our Lettering Needs, especially in those instances where Zapf sketched his ideas on relevant ephemera such as the masthead of the New York Times (Hallmark Textura), a proof of Hammer Uncial (Hallmark Uncial) or a page from his own Pen and Graver (Hallmark Uncial and Missouri). 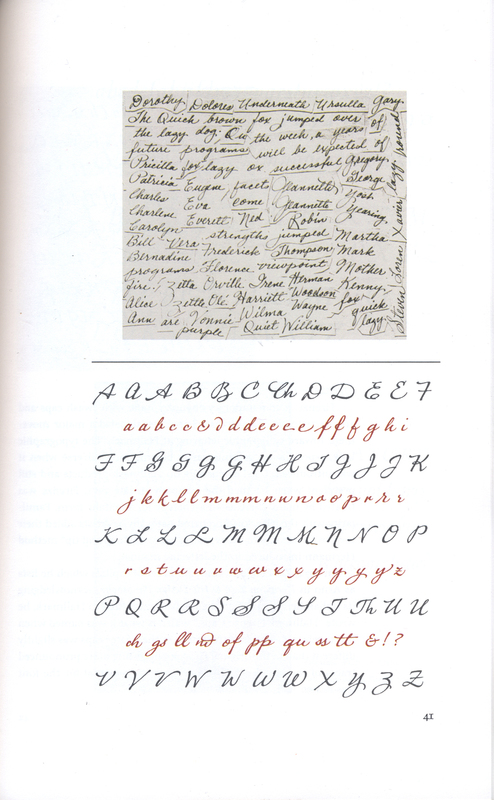 Unfortunately, many of these images are not reproduced large enough to properly see some of the detail in them, such as Zapf’s pencilled notes on a page from Pen and Graver (p. 63) in which he was trying out type combinations (e.g. roman capitals with textura lowercase) or the annotations on his proposal for Missouri (p. 54). In addition to the ﬁlm, the lettering instruction manual and the suite of typefaces, Zapf worked on several other projects for Hallmark. They, along with some unﬁnished designs, comprise the ﬁnal section of What Our Lettering Needs. The most important of these works are Thy Sweet Love Remembered (1968), a book of quotations from William Shakespeare, and Favorite Bible Verses (1974), a pair of books designed by Zapf for Hallmark Editions, the company’s gift book imprint begun in 1967 in imitation of the small books of the Peter Pauper Press and Insel Verlag. The latter contains twelve calligraphic pages by Zapf in which he “celebrates the sacred by exploiting the flexibility of italic letters within a word or a line of text, altering weights and forms where he feels in necessary.” For Cusick, who assisted Zapf on it, the book, “is a lesson about traditional calligraphic forms being allowed to live and breathe, rather than being frozen with thoughtless repetition….” (p. 79) Surprisingly, of the nineteen books issued under the Hallmark Editions name, only six were set in Zapf’s Hallmark typefaces. Clearly, his designs were intended for greeting cards rather than books. Among the unﬁnished or rejected Zapf ideas for Hallmark are a series of posters designed to be printed on acetate for hanging in store windows and plans for a museum dedicated to letter design. 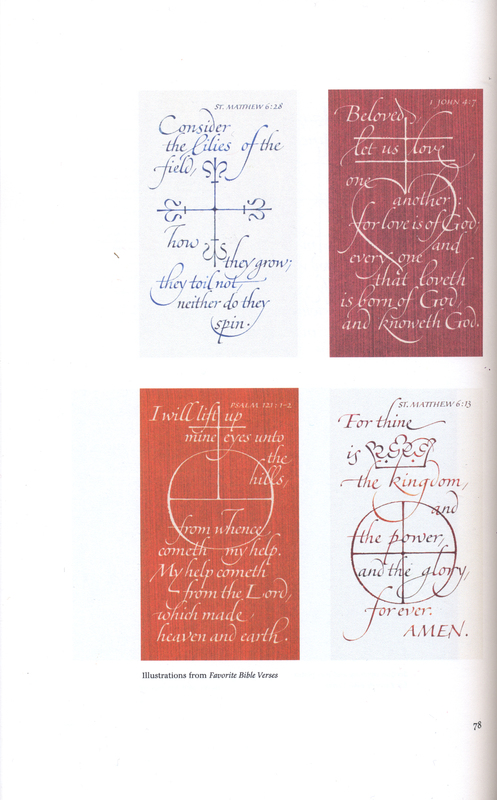 Four designs from Favorite Bible Verses (1974). Calligraphy and design by Hermann Zapf. From What Our Lettering Needs, p. 78. What Our Lettering Needs concludes with an appendix on Zapf’s work with Phil Metzger (1918–1981), a vice president at Kansas City Power & Light who, as a hobby, operated the Crabgrass Press. Beginning in the early 1970s, the two men collaborated on Orbis Typographicus (1980), a successor to Zapf’s earlier Manuale Typographicum, and were about to collaborate on a second book, Typography through Poetry, when Metzger died of a heart attack. Jerry Kelly helped Zapf complete the latter book in 1993. What Our Lettering Needs grew out of “Kansas City and Hallmark”, an essay that Cusick wrote for ABC-XYZapf (1989) and “Cultivating an Education in Letters”, his contribution to Calligraphic Type Design in the Digital Age (2001). Despite this, most of the material in it is refreshingly new—especially the majority of the illustrations. This includes not only background material on the Hallmark typefaces but also production photographs of The Art of Hermann Zapf and examples of Zapf’s design work for the company. This, combined with Cusick’s status as an insider—he joined Hallmark Cards midway through Zapf’s consultancy period—makes What Our Lettering Needs one addition to the growing mound of Zapﬁana that is very welcome. One of the things that differentiates it from About More Alphabets is that it has context. Cusick not only describes Zapf’s work for Hallmark Cards, but he also situates it within the company’s own history. However, he does not cover everything that one could want. For instance, Cusick does not show Hallmark greeting cards with pre- and post-Zapf lettering. Nor does he show examples of lettering by younger Hallmark artists, possibly including himself, influenced by Zapf’s lettering manual and typefaces. Thus, the comparison implicit in his book’s title goes unfulfilled. Nevertheless, What Our Lettering Needs points the way forward for additional Zapﬁana titles. What is needed—if a magnum opus on a par with Adrian Frutiger Typefaces: The Complete Works is not forthcoming—is more small case studies like this. Some possibilities are Zapf’s association with Aaron Burns, Ed Rondthaler and the International Typeface Corporation; his designs for Hell, Berthold, Scangraphic and URW; and his collaborations with Akira Kobayashi for Linotype. Cusick has proven that there is still room for new things to be written about Zapf. *Cusick reproduces a sample of Cresci’s 1560 cancellaresca testeggiata and then resets the text (with errors; see below) in Scriptura (p. 57) for comparison. Scriptura has a similar pelican-jaw g, seriffed p and swashy v but does not have Cresci’s clubbed ascenders. Its ascenders are taller, much closer in proportion to those of Materot. The same is true of its weight. 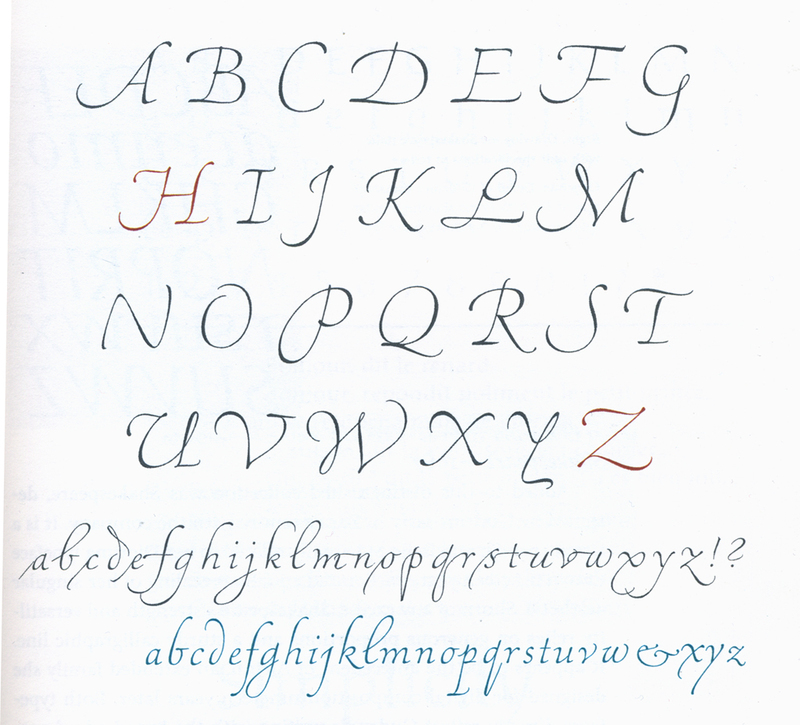 However, Materot’s calligraphy is more condensed and has a more consistent rhythm than Scriptura. • pp. 26–29, 31 The pages from the Hallmark Lettering Instruction Manual have not been shown before, but they are reproduced too small especially since the originals are delicately written in pencil and various colored inks. The pages reproduced are: 3.51 Optical Problems in Lettering; 3.72 Diagrams and Proportions of Capital Letters and an excerpt about the angle of a pointed pen to the writing surface; 3.77 Advanced Exercises [using manipulation and pressure with a broad pen]; 2.14 Joining Script Letters [connection between rhythm and spacing]; 4 Drawing Alphabets for Photolettering; 2.15 Capital Script Letters; 2.41 Flourishes from Warm Up Exercises; and 3.83 Italic Swash Capitals. Cusick says there were several attempts to publish a facsimile of the manual but each foundered. It would still have been instructive to have one—at full size; it could have been annotated to explain techniques, etc. • p. 37 Cusick says some Hallmark alphabets were appropriated but provides no details. • p. 57 Cusick’s resetting of a Cresci text in Scriptura has some letters mistranscribed: e.g. “huomo” is rendered as “huoms” line 1, “le” becomes “li” line 5, “vestire” is rendered as “vestine” 6th line, and “niuno” is “niuns” and “tutti” as “turri” 7th line; the character between “carne” and “mangiare” is not a y but an abbreviation (I think p with additional marks to indicate “pro”.). • p. 65 Cusick is vague on the dates of Constanze and the image which shows its lowercase is too tiny to appreciate. • The images are too small on pp. 66, 70 and 71. • p. 88 There are no captions for photographs.